Abotani or Abutani('Abo' or 'Abu' means father ,'tani' means man),is considered as the primal ancestor of the Tani group of people -Apatani,Nyishi,Adi,Galo,Mishing,HillMiri,Tagin.Abotani,the mythical folk hero and has occupied an enduring aspects in the socio-cultural life of the Tani people. As a whole Abotani can be dubbed as the first Adam for the Tani group of people.They followed the Donyi-Polo belief and considered Abotani as one who introduced the technique of rice cultivation. In the eastern edge of Himalayas in the combined districts of Siang in Arunachal Pradesh,amongst the jagged,forest covered hills and mountains, live the Galo and Adi tribes .Their villages and lands are divided by mighty river that flows from the Tibetan plateaus forming the tributaries of one of the great rivers of the sub-continent ,the Brahmaputra.Through name they can locate the family relationships between themselves and fellow tribesmen(especially in case of Galo tribe)and Abotani . A man's children will take the second syllable of his name,as the first syllable of their.Dakkar,the son of Kardak,is thirty six generations descended from Abotani.His brothers names starts with'Dak',his chidrens' name will starts with 'Kar'. Abotani was a man of jungle ,a hunter and gatherer and like most of the tribes of the North East,their worship was outside the Hindu pantheon,untouched by the Mughal Emperor or Buddhist conversion.They were animists,today it is called the religion of Donyi-Polo-ism,the Sun-Moon worship.Abotani roamed in the mountains until he prostrated himself into the vast plains of the Brahmaputra Valley. Here,he met a goddess, who gave him grains and message of cultivation.He returned to the mountains,where his people resides and spread the grains over the land and waited for germination but it never sprouted out.He returned to the plains once again and enquired for the technique of cultivation from the goddess.With the seed and knowledge of the cultivation,he returned to his place;he brought about an end to his nomadic life,and the art of cultivation was started and began for settlement. Many other legends are told by Tani people about Abotani and his quest for rice.Once he went to a place called Takar-Taji(Tatar Tafi)wherein the marriage ceremony a gour(mithun) was sacrificed.Due to a trick of Abotani,Takar Tafi could sacrifice only one gour,which was meagre for distribution to the guests.Abotani's dog 'Kiipee' and the deer 'Dumpoo' shared a packet of rotten soya seed(staple food in olden days as the use of rice,millet and maize were not known in those days). This led to a quarrel between Kiipee and Dumpoo.Dumpoo kicked the soya seed packet and ran away.Angry Kiipee, the dog chased him .Abotani had to follow both of them .After many days ,Dumpoo ,the deer landed in the world of Digo-Ane (''Keeper of Land",Digo means land,Ane means mother)where people were scattering the rice powder set on the sun for drying. Dumpoo,the deer was caught by the people;Kiipee,the dog followed and was caught too;Abotani followed them and he was also caught by the people of Digo-Ane. The three were imprisoned.After many days,Abotani played a trick;he put a dead mole rat in his armpit and acted as if he were dying.This worried the Digo-Ane people and they freed Abotani and granted the gift of rice,millet and maize seeds. It is the addition of rice to the bamboo culture of the Tani people.Cooking the rice in bamboo,wrapped in water tight leaves,roasting over a fire. It is the complete meal using the jungle and machete.Rice introduced rice-beer(apong).It is not as strong as the distilled clear liquid version that result in permanent hang over. The Galo drink is semi-sweet,dark in colour and very drinkable.Smoked rice husk are placed over the cooked rice for preparing it,leaving it for a one week fermentation.The result is placed in a cone over which water is slowly poured over the blackened white rice,filtering through a bottle or a can beneath. Another story says that a woman in Digo-Ane told him how to cultivate rice.Abotani has a lot of success in his rice cultivation due to the help of his wife Aio Diilong Diibong;however he divorced her to marry another woman and this brought a disgrace to his wealth because the new wife was to much fond of leisures;when Abotani realized this,he left the second wife also and continued to cultivate on his own ,but still he had to asked for help of his sister to be safed from the danger of falling from the top of a tall tree where he had climbed. 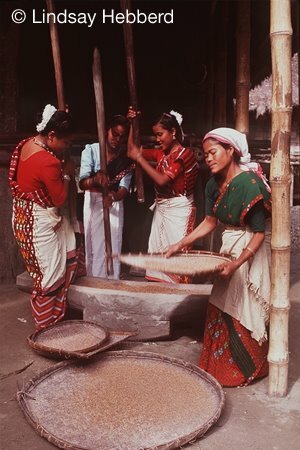 Even the legendary life of Abotani and in his quest for rice are part of a tradition of the Tani people and are celebrated in different period of the year(following the rice cultivation season). Abotani is a symbol of struggle of human kind for food and prosperity through difficult situations and of the need for harmony between man and wealth to bring wealth to the family. The tales of Abotani and belief in Donyi-Poloism binds together the Tani groups of people today in various walks of their life since the ancient past.